'My visit to Bob Marley's 56 Old Hope Road home/museum was an experience that I will never forget" said California base, Belizean Reggae artiste Eljai. "It was me and producer Mr. Fabian Cooke who is also real good friends of the Marley brothers. 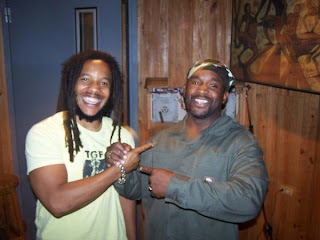 We went to Jamaica to release a single entitle, 'Blessed' but we needed a DJ on it so he took me to Bob Marley's home. I didn't know why we were going there but we went anyway. When we got there, there was some security guards at the gate so he had to tell them who he was then they (the security) went and told someone else who gave them the authority to let us in. We went in the yard, parked and some guys came and got us then showed us where to go. We went inside and to my surprise!!! there was Mr. Steven Marley in the studio. It was my first time seeing any Marley up close so I was like star struck. But Steven was kool and so 'down-to-earth' it was like we knew each other a long time, that helped me to stay calm. My friend Fabian started talking to Steven about my music and what we were in Jamaica for so Steven asked him for a cd which he listened. After hearing all the tracks, Steven, looked at me and said, "all the songs are real good what are you guys gonna do with them?" Fabian said he was gonna put them out on his label but we needed a DJ for the song called, 'Blessed.' Immediately, Steven suggested Capleton is the man for that collab, "he will bring real fyah to it" he said. Steven and I talked thereafter about his dad the great, Bob Marley then he showed us around the studio. We took some pictures and vibe for a few, then Ms. Marcia Griffiths showed up, damn!! Well she brought 'cane juice' for Steven which he shared with us, he is a real down to earth guy, he even invited us over to listen to their rehearsal for a show they had called, Welcome to Jamrock in Kingston days after. So I also met Damian Junior Gong Marley another awesome Marley all in one day at 56 Old Hope Road in Kingston. I could feel the presence of Bob there strong, it was great so we went back daily. It was my place to be to see the rooms where they slept, the kitchen where they tried to kill the great, Bob Marley. Just to be in the yard was good enough for me, "what an awesome experience and a great visit!"